When I first found out about how much time and money green juice powders could save me compared to making my own juices I was immediately hooked. I could still get all the amazing health benefits with no messy cleanups and constant trips to the store. Fast forward 3.5 years later and I have tried 17 different brands looking for the best green superfood powder. Okay I was a little bit obsessed but don’t judge me! I’ve had so many of my readers ask for my favorite brands so I’ve finally decided to put together a few in depth reviews on the best green superfood powders on the market. If you’re in a hurry you can checkout the scoredcard below or you can keep reading for my full in depth Organifi Green Juice review. In this review I’ll be covering Organifi Green Juice. I’ll cover everything you need to know so that you can make an informed decision on whether or not it is the right green drink for you. We will take a look at the ingredients in Organifi Green Juice, what benefits you can expect from it, go over the taste and the price, talk about what I like and dislike, and finally compare it to some of my other favorites out of the 17 green superfood powders that I have tried! Organifi is a powdered superfood mix consisting of 11 different organic ingredients. Okay so the ingredients sound promising, but how does Organifi’s blend stack up against some of the other top brands? Chlorella, Spirulina, Wheatgrass, and Matcha are all staples in the green juices that I’ve tried so I was glad to see these included in Organifi as well. I found it surprising that they count lemon as one of their 11 superfoods because it isn’t necessarily what I’d consider as a “superfood”. Although lemon does have some great health benefits, it probably isn’t present in large enough quantities here to have a significant impact. 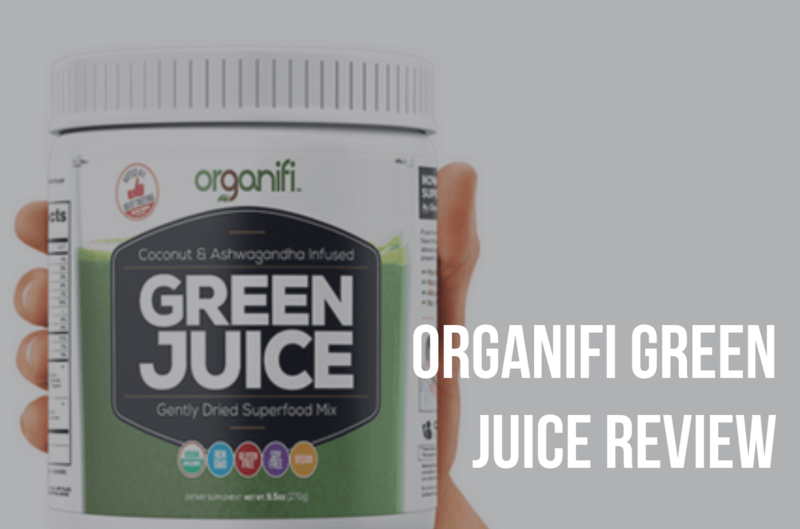 What really makes Organifi Green Juice stand out from other brands though is the Ashwagandha and coconut water crystals. Ashwagandha is an adaptogen that is known to reduce stress and inflammation, increase brain function, and has even been shown to have anti-cancer properties. If you haven’t heard of Ashwagandha and its many benefits yet then you will soon, it’s the next big thing in the superfoods and health world. The only other greens powder that I’ve tried that also has Ashwagandha is Athletic Greens, which is another great brand. On the other hand, Coconut Water is something you have definitely heard of by now and for good reason. Coconut water is a nutrient rich source of hydration loaded with potassium and other natural electrolytes without all of the added sugar found in sports drinks. But what’s most important here is that it aids the body with the transport and absorption of the other ingredients so that you can get the most out of all the wonderful superfoods and greens in your juice. None of the other green juice brands I’ve tried so far have had this so it’s definitely a nice feature. Before I tried Organifi, I was mixing my superfood powders with coconut water for the extra benefits and to improve the taste which quickly became an expensive habit (hey it’s hard to resist when you can make your healthy green drink taste like a Piña Colada). Each serving of Organifi Green Juice is broken down into 5100 mg of alkaline greens (wheatgrass, matcha, spirulina, chlorella, and moringa) and 1450 mg of nutrient dense superfoods and antioxidants (ashwagandha, beets, and turmeric). These numbers are on par with most top rated brands like Amazing Grass Green Superfood, but are definitely lower than some of the premium (and expensive) brands. Athletic Greens for example contains 8400 mg of alkaline greens and 3000 mg of herbs and antioxidants – but is almost twice the price of Organifi. I see tons of Organifi Green Juice reviews base their decision solely on these numbers but what is important to realize is that these numbers don’t tell you exactly how much of each individual ingredient you’re getting. Athletic Greens may have around 12,000 mg of total active greens and herbs but that is split up between it’s 75 different ingredients which means some of those ingredients are not present in high enough quantities to even have a noticeable impact. Then there is Organifi’s 6500 mg which is only split between 11 greens and superfoods, so I know that I’m getting an active amount of each ingredient listed which is something I really appreciate. One thing that is missing in Organifi’s blend is probiotics. Probiotics are great for gut health and digestion and they are found in many other green drink brands so I’m not really sure why they were left out of Organifi. I personally drink green juice for its other benefits but if you drink it specifically to aid with digestive issues then I would recommend going for a brand that contains probiotics and digestive enzymes like Amazing Grass or Athletic Greens. Overall, I give Organifi Green Juice’s ingredient formula an 8.5 out of 10. It covers all of the basic ingredients that I look for in a green superfood powder, while also boasting some unique ingredients and awesome features like the ashwagandha and coconut water. I love that they keep their blend down to a simple, short list of ingredients so that I know I’m getting a relevant amount of each ingredient. Unfortunately, Organifi does not include the probiotics and enzymes for digestive health that are found in other top brands which is definitely a missed opportunity. While the ingredients may vary from brand to brand, the overall benefits you can expect from drinking green juice remains the same. Thats not to say all green juice powders are created equal though, some are much more effective than others. Out of the 17 green superfood powders I have tried, Organifi is tied as the most effective. The majority of these health benefits are not immediate and come over time. It’s important to realize that green juice is not a miracle cure. If you want to reach your goals you need to set realistic expectations. You can’t expect to lose 10 pounds or have glowing skin overnight. However, give it a few weeks and your body will reap the rewards. The most immediate and noticeable effects I feel after consuming Organifi Green Juice are a boost in energy and mental focus. If you’re familiar with matcha then you know the energy boost I’m talking about. It’s not jittery like the feeling you get from coffee, instead it’s a clean and natural energy that lasts throughout the day. Why is Organifi So Effective? What makes Organifi so effective compared to other top brands like Amazing Grass Green Superfoods is that Organifi is primarily a superfood blend. Amazing Grass and many other brands contain fruit and vegetable fillers like pineapple, broccoli and spinach that make up a large portion of their serving size. These veggies are great and very nutritious, but they should already be present in sufficient amounts in a healthy diet. When spending my hard earned money on a superfood powder I’m looking for those hard to get antioxidants, phytonutrients, and micronutrients that make superfoods “super”. That’s what makes Organifi one of the best green superfood powders when it comes to effectiveness. Overall, I give Organifi Green Juice a 10 out of 10 for its effectiveness. Even though I’ve been juicing for 4 years I’m still amazed at just how effective Organifi Green Juice is compared to other brands and even my homemade juices. Taste is one of the biggest factors for me when deciding on a green superfood powder. If I don’t like the taste then I won’t drink it often enough to see tangible results and health benefits. Unfortunately, this is where most of the brands that I’ve tried fall short. Most green drink powders taste terrible, some are manageable but I found myself still having to mix them with juices or smoothies which kind of defeats the purpose of having a convenient green drink powder. Organifi Green Juice on the other hand is the second best tasting superfood powder that I have tried and I can drink it straight by just mixing it with water! This makes it very convenient on those days when I’m in a hurry. I would describe its flavor as minty and sweet with hints of lemon and coconut – It’s a very refreshing taste. I’ve actually grown to crave Organifi every morning which makes it very easy to get my daily dose. The only brand I’ve tried that has a better taste would be Athletic Greens. It has a more sweet and fruity taste (I love fruit juice so I’m probably a little biased on this one) but really they are both delicious. Overall I give Organifi Green Juice a 9.5 out of 10 for taste. Although it’s not the very best I’ve had, it comes close. I really enjoy the minty, sweet, lemony taste of Organifi Green Juice. I find it refreshing and it’s something I crave, which is rare in a market full of awful tasting superfood powders. Where Can I Buy Organifi? You can get Organifi Green Juice at a variety of price levels but in general it is on the more expensive end. One bottle is 30 servings and sells for $79 (I actually get around 35 servings but I don’t use heaping scoops). This makes it the fourth most expensive brand I’ve tried. As great as Organifi is, at $79 it is pretty pricey. Fortunately, you can find it on Amazon for around $65-$70. Which brings it more in line with other brands. Amazon also offers bulk discounts for purchasing multiple bottles at once. By purchasing 3 bottles you can bring your cost down to $60 per bottle. This is what I do and is what I personally recommend once you have tried Organifi Green Juice to make sure that you like it. If you break it down, Organifi Green Juice will cost you between $1.63 to $2.63 per serving. That is definitely cheaper than buying expensive pre-bottled green juices and is almost as cheap as juicing yourself. If you’re new and just looking to experiment with green superfood powders or you’re really trying to cut down on costs then I would recommend trying Amazing Grass Green Superfood. You will be making some sacrifices in terms of taste and overall effectiveness but at $0.70 per serving it’s the best bang for your buck. On the other hand, if you don’t mind spending more to get the absolute best then I’d recommend Athletic Greens. It is just as effective as Organifi but also contains probiotics for gut and digestive health. This doesn’t come cheap though, Athletic Greens runs at $97 per bottle or about $3.23 per serving. Overall I give Organifi Green Juice a 8 out of 10 for price. It is on the expensive end for green superfood powders, but it is definitely worth the price. It becomes very affordable if you take advantage of the bulk discounts. Does it contain sugar is it diabetic friendly? It’s sweetened naturally with monk fruit so it contains just 1g of sugar per serving!